Hi Efurryone, it’s me Cookie! We are very excited because Christmas is coming! We have been getting pretty holiday cards from our furriends, and that is so much fun! If you would like to exchange holiday cards with us, please email us at TheFurryBambinos AT gmail DOT com. We can send cards overseas, too. We would love to send you a card! When we last left off telling you about Mama Rose and Her Babies, six bebbeh kittehs and Mama Rose had been trapped in humane traps in Penny and Bob’s yard next door. Mommy and Daddy transferred the feral fambly to cages in the garage. Now Mommy and Daddy needed to start work socializing the bebbeh kittehs. Mommy did not know much at all about working with feral kittehs. Feral kittehs are different than “domesticated house cats” (for lack of a better term). Not all stray cats are feral. Just because a cat does not have a home does not mean it is feral. So what does feral mean, then? 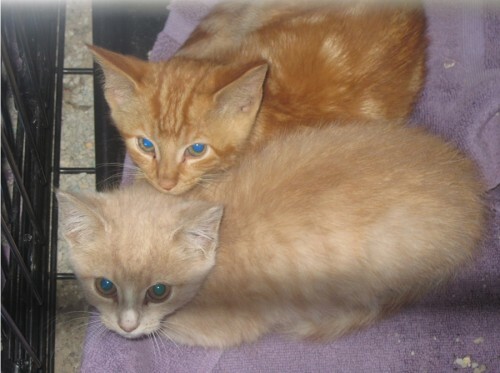 Feral kittehs have not had contact with humans during their crucial kitten development time. If a kitten is not handled by people when they are very young, they grow up being afraid of people. They view people as potential predators, and are understandably terrified when a person tries to get too close. Like most of your parents, Mommy has lots of books about kittehs. She looked through every single book, and found hardly anything at all about feral kittehs. So she asked her good friend Google for help. Mommy did some crash course reading online to try to learn how to work with and hopefully eventually get the feral kittehs to trust her, Daddy, and other people. There are some great online resources available – Alley Cat Allies in particular, but we will list resources in another post in case you are interested. The whole goal of the process is to help the feral bebbehs learn to TRUST Mommy and Daddy, and other people too. Mommy was cautioned to make sure to let other people work with the feral kittehs, or else the bebbehs would be tame JUST FOR MOMMY. Which as you can imagine would defeat the purpose of taming the bebbehs so that they could be adopted to other famblies. Mommy started off by not trying to touch the bebbehs for two whole days after they had been trapped. She read that it is best to give the kittehs some time to see that Mommy and Daddy did not mean to harm them. For those first two days, Mommy just reached into the cages to change the water and food. Mommy placed the food and water dishes near the doors to the cages so she would not have to reach too far into the cages. Mommy also removed the litter boxes from the cages, and Daddy scooped the boxes while the boxes were outside the cages. The bebbeh kittehs would cower in fear every time Mommy reached into the cages. The bebbehs went to the far corner of the cage, and would huddle together. Their Mama was NOT HAPPY AT ALL any time Mommy reached into a cage containing her bebbehs. Their Mama would stand up and HISSSSSS and GROWWWLLLL at Mommy. Even inside of a cage, a feral Mama cat was pretty intimidating! Mommy read that you should not try to come at a feral kitteh with your hand open and aim for their face. So next, Mommy began gently touching the feral bebbehs with the back of her hand. She gently stroked the bebbehs on their lower bodies – their hind legs area. Mommy also read that it is VERY IMPORTANT not to stare a feral kitteh in the eyes for extended periods. Staring a feral cat in the eyes is a sign of aggression and will cause the feral kitteh to become even more defensive. So Mommy and Daddy made sure to make only very brief eye contact with the feral fambly. Mommy would look at the kitteh, then look away, then look at the kitteh, and then look away again. Mommy also read that feral kittehs are terribly afraid of human voices. So to help them get used to people, Mommy read that it helps to leave a radio or TV playing in the room. So Daddy found a radio, and then put it in the garage with the feral fambly, and turned in on low volume. Mommy’s good friend Dorothy told Mommy to make sure to turn the radio OFF from time to time, because constant NOISE is a form of torture. After a few days of gentle touching, Mommy began to try to pick up the bebbehs and hold them for brief periods of time. When Mommy picked up a bebbeh, she made sure to “scruff them” – to pick the bebbeh up by the scruff of the neck. This does not hurt the bebbeh! When a bebbeh is scruffed, they relax and go limp! This is a natural reaction that they have so that when their Mama Kitteh picks them up, they don’t get all squirmy while she carries them in her mouth. Mommy started by holding the bebbehs for very brief periods of time – like 20 seconds – and then returning the bebbeh to its cage and immediately feeding the bebbeh. This is so that the bebbehs would begin to associate getting held with getting food! At first, the bebbehs would not eat in front of Mommy when they were returned to their cages. Next, Mommy would hold the bebbehs for longer periods of time – one to two minutes. Mommy held the bebbehs close to her chest with both hands securing the bebbeh so they would not escape. At this time, Mommy began to try to determine the gender of each bebbeh, and choosing names. Mommy’s good friend Christine (and advisor in PAWS) suggested giving the fambly “outdoorsy” names since they were found outside. Mommy confirmed that the little calico was a girl! Mommy and Daddy named her Marigold. Mommy confirmed that the dark orange tabby with swirls was a boy! Mommy and Daddy named him Rusty. Mommy confirmed that the buff tabby with white bib and white paws was a boy! Mommy’s friend Christine suggested the name Hunter. Mommy learned that the little brown tabby was actually a boy, not a girl like she had originally guessed. Mommy named him Woody. Two of the bebbehs were too squirmy to hold and also check their gender, so those two would have to wait to get named. They were the silver tabby and the dark orange tabby with the white bib and white paws. And to go with the outdoorsy theme, Mommy thought the name Mama Rose was appropriate for the Mama. Can any of you guess why? Next time, teaching feral kittehs how to play with cat toys! Filed by Cookie on Dec 22nd, 2010 under Baby Pictures, Cookie's Posts, Feral Kittens, Fosters, Hunter, Mama Rose, Marigold, PAWS, Rusty, Sky, Sunny, Woody. Leave a Purr or Hiss. Oh yes, adult feral kitties can be very intimidating, but we know it is only because they are so skerred. I like the names you picked out! Hurrah! The lil tots are coming along, we hope that they will learn to be fine Cats. Kudos to your parents for their patience. They are doing so well with the bebbehs. I was taken in as a stray but SS thinks I was not really feral although I didn’t and still don’t know how to play with toys and don’t like to be touched or held except by SS. I also hiss a lot to put people off from approaching me. Oh wow we are so behind – we didn’t know about Mama Rose and her babies! We are so excited to read about them and hope they progress well! It sounds like your mom and dad did such a good job of learning what to do so that they feel safe!! Just coming by to wish you all the very best in the New Year. Your parents are just wonderful to be looking after all those kitties.